I'm planning to travel by air and would like to take my dog with me. What are some of the factors I need to consider before taking my dog on an airplane? Having your dog accompany you during travel may add enjoyment to your trip. However, it's important to keep your dog's safety in mind when traveling, so be sure to check with the airline well in advance of your trip. Familiarize yourself with the airline's pet travel requirements so that you can avoid a last minute crisis. If possible, avoid flying your dog as "checked cargo" during times when temperatures on the ground are likely to be below 40ºF (4 C) or above 80ºF (21 C). Some airlines will not check pets as baggage in the summer months because of the heat and humidity in the cargo holds. If possible, use airlines that hand carry your dog (inside the pet carrier) to and from the aircraft. Otherwise, the pet carrier might simply be placed on a conveyor belt along with all the other baggage. "Take direct flights whenever possible and try to avoid connections and layovers." 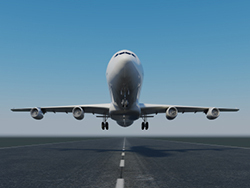 Take direct flights whenever possible and try to avoid connections and layovers. Sometimes this is easier to do if the travel occurs during the week. This eliminates missed baggage connections and the chance that your dog will be left exposed in extreme weather. Verify your airline's policy regarding baggage liability, especially with respect to your dog. In some cases, your general baggage liability coverage will include your pet. Check your ticket for liability limits or, better yet, speak directly with the airline. If you are sending an economically valuable pet, you may want to purchase additional liability insurance. Many airlines will allow one pet to travel in coach and one in first class, with some provisions. Since some airlines limit the number of pets traveling within the cabin area, be sure to book well in advance if you plan to travel with your dog in the cabin. Your dog must be in a standard carrier that will fit under the seat (a collapsible fabric carrier may be suitable), must remain in the carrier during the flight, and must not disturb your fellow travelers. Obviously, only small dogs qualify for this type of accommodation. Are there any special veterinary considerations? Have your dog examined by your veterinarian in advance of the trip, especially if it has been more than a few months since the last health check, or if the dog has any health problems. Travel by airplane can pose a health risk to dogs with heart or kidney disease, or with some other pre-existing medical problems. Dogs with short faces, such as Pekingese, Pugs English Bulldogs, Boston Terriers, et cetera, can run into respiratory difficulty in a confined carrier or if they are placed in the cargo compartment of the airplane, especially during hot or humid weather. Discuss these issues with your veterinarian prior to travel. Purchase any pet supplies that you might need in advance of your trip. These include heartworm and flea preventive or any prescription medications that your dog may require. If your dog is on a specific diet, especially a therapeutic diet, you need to ensure that it will be available at your destination or take along a sufficient supply. "If you are traveling to a foreign country, you may need to provide a specific international health certificate signed by a government-approved veterinarian or other government official." Update all vaccinations, especially rabies vaccination, and take written documentation with you. A health certificate for your dog may be required by your airline. If you are traveling to a foreign country, you may need to provide a specific international health certificate signed by a government-approved veterinarian or other government official. The specific requirements for travel vary by country, either within North America or to other continents, and it is your responsibility to ensure that you meet all the criteria for your chosen destination. Requirements may include written proof of certain vaccinations, blood tests or anti-parasitic treatment that has been performed within a specified time period. It may take several days or even weeks to get test results or obtain the appropriate paperwork so plan well in advance. You can obtain the specific requirements from the consulate's office, or by searching the government website for the country of interest. You should also inquire about any quarantine requirements, especially if your destination is an island country. How should I prepare my dog for the flight? Make sure the travel carrier has specific feeding and identification labels permanently attached and highly visible. The information on the label should include your name, telephone number, flight schedule, destination, and the telephone number of someone at the point of destination. Do not rely on baggage tags as they may become lost or damaged. Your dog should wear an identification tag attached to a collar or harness (a harness is preferable since it is more secure than a collar). You should provide a leash with the carrier, for secure restraint in case your dog needs to be taken out of the carrier. All tags should have updated contact information on them so that you or an emergency contact can be reached at all times. For additional security, all pets that travel should be microchipped prior to travel (and you should take a copy of the number with you for reference). For further information, see our handout "Microchipping". "Do not tranquilize or sedate your dog without first discussing it with your veterinarian." Do not tranquilize or sedate your dog without first discussing it with your veterinarian. If you feel that your dog needs to be sedated for travel, your veterinarian will advise you on safe medications. In order to determine the most appropriate dose, your veterinarian may recommend giving a "test dose" of the medication to determine its effect in advance of the trip. Do not feed your dog within six hours of the flight. You should provide fresh water until flight time. Water should be available in the carrier during the flight whenever possible. Give the dog fresh water as soon as it arrives at your destination. What do I need to consider when buying a travel carrier? The carrier should be large enough for your dog to stand up and turn around easily, but not so large that the dog will be tossed about inside during turbulence. Crates are available for dogs from two to two hundred pounds. Make sure it is an "airline-approved" crate. The walls and floor of the crate should be strong and waterproof. This will prevent crushing and waste (urine) leakage. You can place a disposable absorbent puppy-training pad or an underpad designed for bedridden people with bladder control problems in the bottom of the crate. There must be adequate ventilation on at least three sides of the carrier. Holes and slits in the sides are characteristics of a good quality carrier. The carrier must have sturdy handles for baggage personnel to use. The carrier should have a water tray that is accessible from the outside so that water can be easily added when needed. Try to familiarize your dog with the travel carrier before you leave for your trip. Let your dog play inside with the door both open and closed. This will help eliminate some of your dog's stress during the trip. 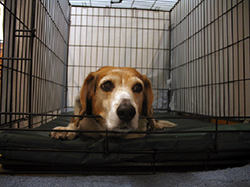 Pet stores, breeders, and kennels usually sell carriers that meet these requirements. Some airlines recommend specific carriers that they prefer to use. Check with the airline to see if they have other requirements or recommendations. What about carry-on kennels for my small dog? Small dogs may be allowed in the passenger cabin as long as the carrier will fit under the seat. Soft, airline-approved, carry-on kennels, sometimes called Sherpa bags, are available. Be sure to check with your airline regarding their specific carry-on policies and requirements. There may be an extra charge to take your dog in the passenger cabin. What arrangements should I make at my destination site? "Do not try to "sneak" a pet into a hotel." Make sure that your hotel allows dogs. Many bookstores carry travel guidebooks with this type of information. There are also helpful websites, such as www.petswelcome.com, www.petfriendlytravel.com, www.dogfriendly.com, www.pets-allowed-hotels.com or www.travelpets.com. Do not try to "sneak" a pet into a hotel. Not only may you be forced to leave or be given a financial penalty, you will give the hotel a negative impression of pet owners. If you leave your dog unattended in hotel rooms, make sure that there is no opportunity for escape. Leave the dog in the carrier or inside a closed bathroom. Be sure to inform housekeeping personnel about your dog and ask that they wait until you return before entering the room. Use the "Do Not Disturb" sign. Should your pet get lost, contact the local animal control officer. If your pet is microchipped, give the number to them so that you can be contacted directly if your dog is located. Remember, advance planning is vital to making the trip an enjoyable experience for both you and your dog. By applying a few common sense rules, you can keep your traveling dog safe and sound.